The F2300 provides protection from both fire and water. 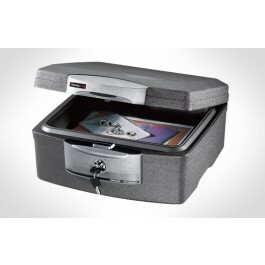 It carries a UL 1 hour fire rating for documents and an ETL 1 hour fire protection of CDs and DVDs. The F2300 security chest has a door seal that protects the interior from water spray. This security chest comes with a key lock.